The A. Gaidar Youth Library is located on the fourth floor of a building constructed in 1913 by P.Mulkhanov according the Modernist Style. Our library opened in 1930 and occupies 400 square meters. First it had status of a branch of the Central Children library of Petrogradskiy district, established in cooperation with one of the school libraries. The first Head of the library was Tulinova Alevtina Grigoryevna, who had been working for 37 years. The library stuff made the great work popularizing Russian and foreign literature. During the Great Patriotic War (1941-1945) the library continued its work in spite of very hard conditions. In the period of blockade (for 900 days) the library worked on basis of school #50. 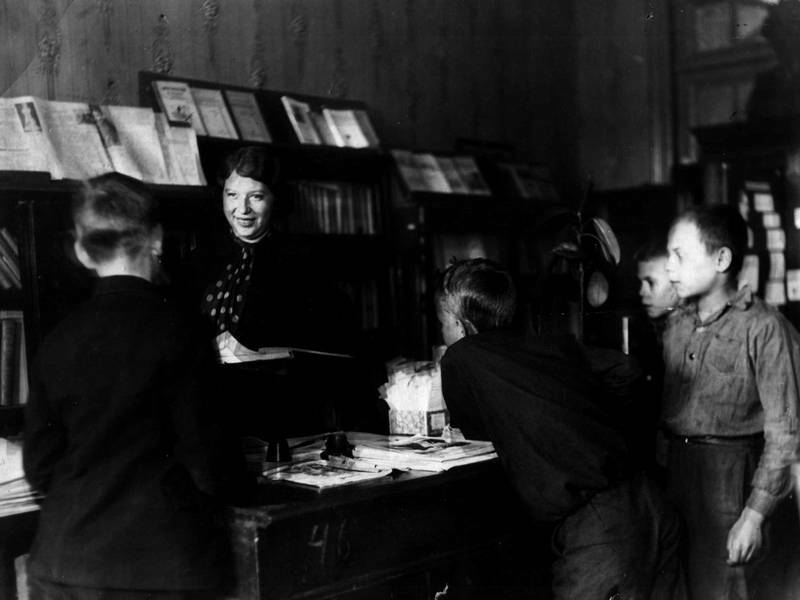 Tulinova Alevtina Grigorevna - director of library since 1930 to 1967. In 1955, the library was named in honor of A. Gaidar, a noted Russian author of children's works. In 1978, the library was brought into the Petrogradskyi District Centralized Library System. The Petrogradskyi District is the historical center of St. Petersburg and is comprised of some 130,000 residents. The Library System consists of eight libraries, which altogether hold more than 500,000 volumes. The Library System services more than 30,000 a year readers, or 23 percent of the district. Gerke Nina Nikolaevna - librarian since 1948 to 1998 years. The library has more than 4,500 a year readers ranging from the very young to those who first made their visits prior to World War II. The library serves 1,100 children ranging in age from pre-school to 13 and 2,500 young adults ranging in age from 14 to 25. The vast majority of users are secondary school students and college/university students. In our library, we pay particular attention to serving the needs of l.d. children. The library offers its readers to use the Youth department; the Children's department and the Computer- game centre "I Play and Study", the Reading-hall and the Information-and-game computer centre "Open Library World", Literary Drawing room. Now our library works under the program "The Circle of Friends", which is the logical continuation of the program "The Open Door ". In 2000 the library began to work under? (=on) the program "The Open Door". The program got the financial support from the Open Society Institute (Soros Fund in Russia). The aim of the program is social and psychological rehabilitation of pupils of Children's House-school №14and children from the Center of rehabilitation of neglected children. In 2001 the library began to work on program "The Circle of Friends". The program got the financial support from the Open Institute (Soros Fund in Budapest). The program is aimed on organising leisure activities of children who have working parents and children who have too much free time. The Integrated Communication Centre was established within the framework of the library for homeless children, children of the group of risk, disabled children and also pupils of Children's Home #14. Eight groups of children and teenagers attend numbers of events and also visit the information-and-game computer centre "Open Library World" every week. All together during the period from 01.10.2001 to 30.04.2002 110 patterns were made, which 1256 children and teenagers attended Collections. The library holds some 52,000 books and subscribes to 75 periodicals. The library has a collection of fiction and non-fiction books in ten different foreign languages and a collection of rare books published prior to 1937. All our materials are catalogued and are filed according to our card catalog. We opened a computer center in the spring of 2002, a website in May of 2002. The library is located within St. Petersburg, Russia, a city of five million. Founded by Peter the Great as a 'window to the west,' it is currently Russia's second largest city. It is not only north-west Russia's main port and a major industrial and financial center, it is also home to the world famous Mariinsky Ballet Company and the Hermitage, the third largest museum in the world. This May, the city will celebrate its 300th anniversary.